VALLETTA, MALTA: How often do you come across thousands of years’ worth of history, blue waters, and good Mediterranean food over 316 sq. kilometers of land mass? This can only happen when you come to Malta. Being by the Mediterranean Sea, Malta’s capital Valletta is more than just a beautiful old town of this island nation. But what makes this harbor city prettier is that the city kept its 16th century look at almost every corner. It was one of the earliest sites that got listed in UNESCO World Heritage Site for its old world splendor and magnificent Baroque architectures. 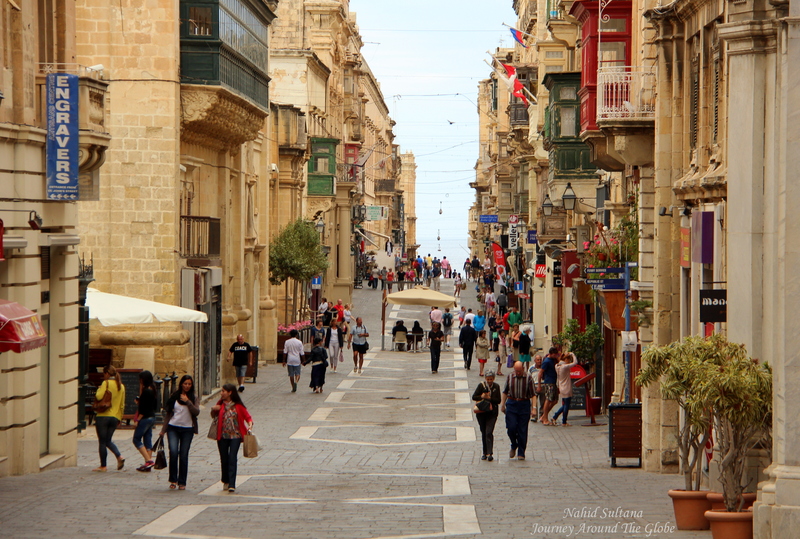 Valletta was one of the first cities in Europe to use a grid street system. I used to look for colorful doors, windows, and typical wooden window-like concealed balconies while walking in the old town…these are everywhere and add more beauty to this place. Malta is a small island and inhabit a tiny spot in the universe but it has a culture that spans about 7000 years. Valletta was built as a fortified city – intended to keep the enemy out. 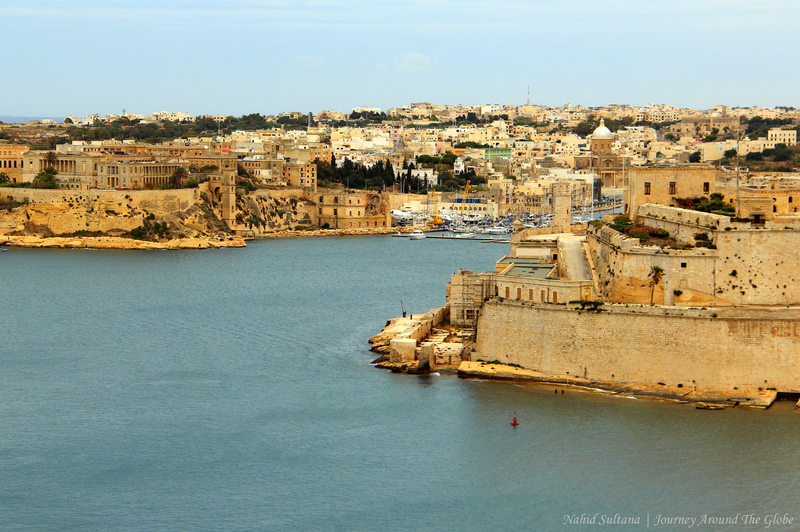 Historically, Knights of St. John built Malta in 1565 AD to protect the land from the Turks. From the earliest days of the Knights of St. John on Malta, they kept a guard ship and troops near the entrance of Grand Harbor looking for Ottoman spies. Later the country was attacked and conquered by many civilizations over and over, finally getting its freedom from the British in 1964. Maltese speak very good English and are very welcoming. Local language here is a very unique language that combines different languages like Arabic, French, Italian, and Spanish. 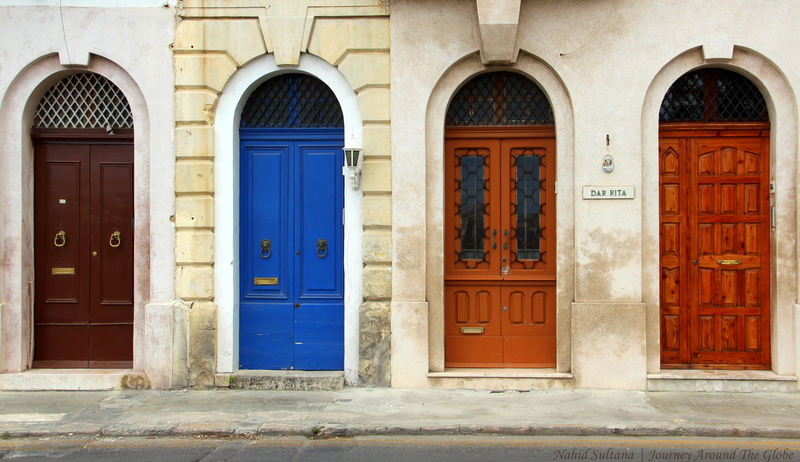 Republic Street and Merchant Street are the main and parallel streets of Valletta. 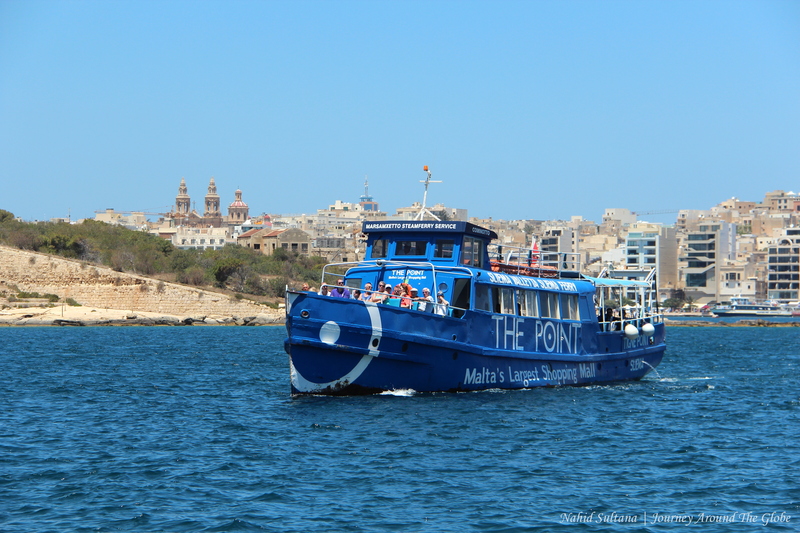 Marsamxetto Ferry Service is the best way to go back and forth from Sliema to Valletta. There are also public buses from Sliema, but ferry is the best way. They run every half an hour from 7 am – 6 pm and 10 – 4 on Sundays and public holidays. It is 2.80 euros for round trip per person over 5 years of age and it takes less than 15 minutes to cross the water-body. There are many companies who offer boat tours of various kinds to various parts of Malta, like the islands of Gozo and Comino (see my post on Gozo & Comino). They come in many services, prices, and timetables. If you are planning to drive in Malta, just keep in mind that they drive on the left side of the road like the Brits. We also rode on a horse-wagon after the ferry ride to Valletta to go to St. John’s Cathedral for 20 euros for all of us with an extra visitor, Charlie. We met Charlie, originally a Maltese but lived all over in the USA for 61 years, at Marsamxetto Ferry terminal on our way to Valletta. He came back to his own land recently to spend rest of his life by the sea. He got on the horse-ride with us and was very energetic giving us some general insides on this island. 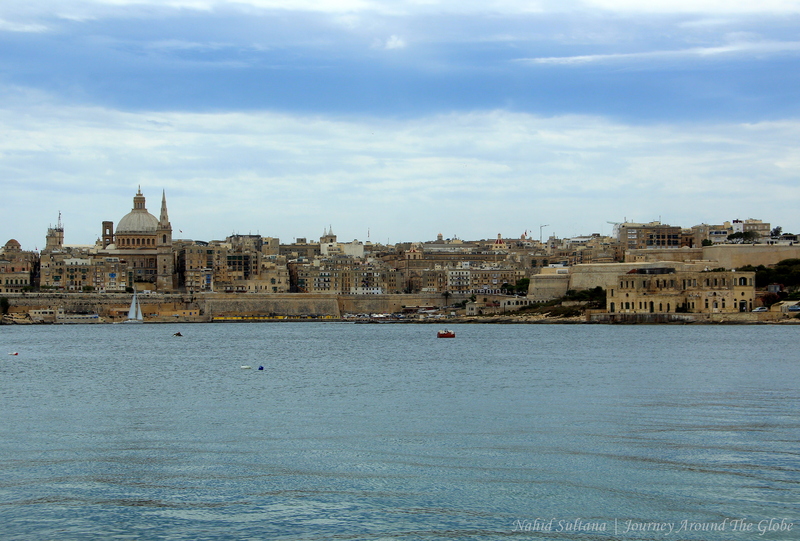 TIME of TRAVEL: We flew to Valletta in the first week of June 2013. We were expecting some hot-summer days there. It was above 75 degrees but little bit windy every now and then. Overall, the weather was pleasant. June is in fact a great time to visit Malta. The weather is warm yet the beaches and bays aren’t taken over by the tourists. As it gets deep into summer, the weather can get really crazy hot and places become more crowded with hundreds and thousands of tourists. Maltese population triples to nearly 1 million tourists from all over the world during this time. OUR HOTEL: We stayed in Hotel Plevna in Sliema, another city in Malta. The best parts of this hotel were the location and view. We could see the Mediterranean Sea from our balcony both on the right and left sides. I actually managed to get up one morning around sunrise at 5:30 am and walk to Sliema promenade to take some shots and enjoy the morning sun. The hotel itself was pretty awesome too, had breakfast included in the price. The only thing we wished was Wi-Fi in our room, lobby had free connection though. The hotel also had free beach club for its guests by Sliema Promenade. We used to walk only 5 minutes to the ferry terminal to go to Valletta. All the nice restaurants (along with McDonald’s and Burger King) are also very close-by with a nice sea-view and skyline of Valletta on the other side. If I ever go back to Malta, I will stay in Hotel Plevna again for its nice staffs and great location. 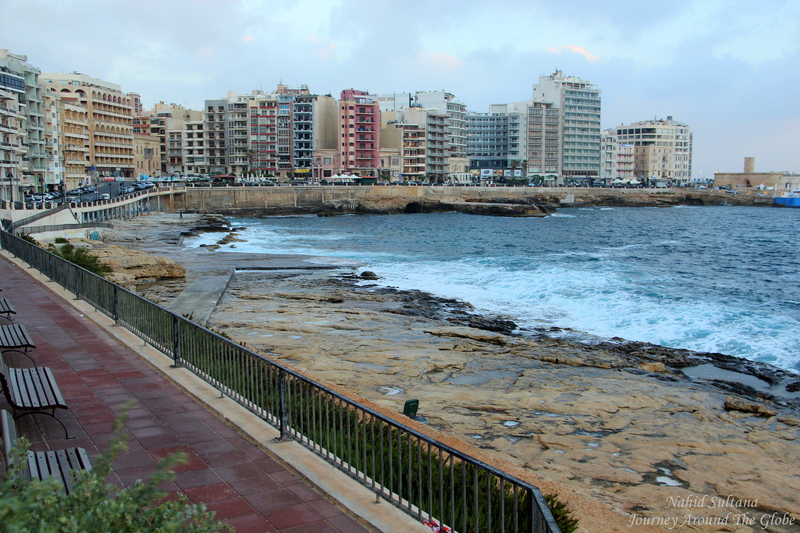 Sliema is one of Malta’s most modern areas and this is where most of the tourists stay. The promenade offers great view of the blue sea. 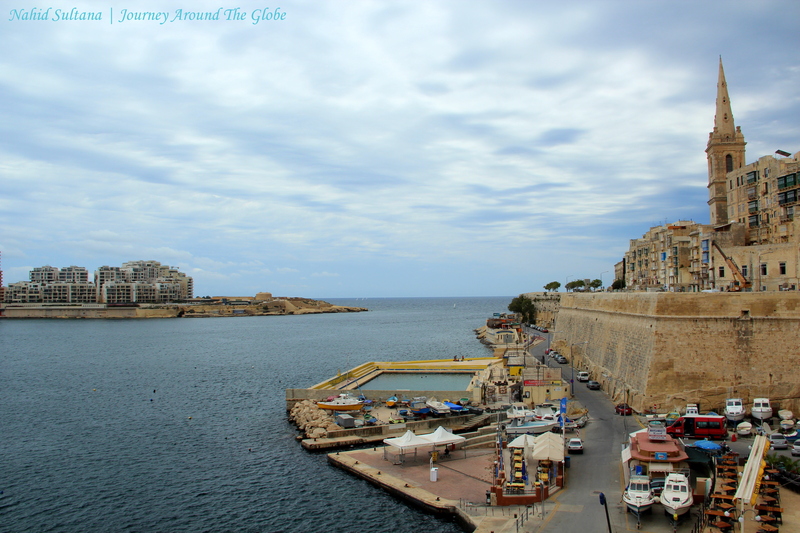 The main harbor of Sliema also is a great place to hang out, enjoying nightlife, eating, and shopping. 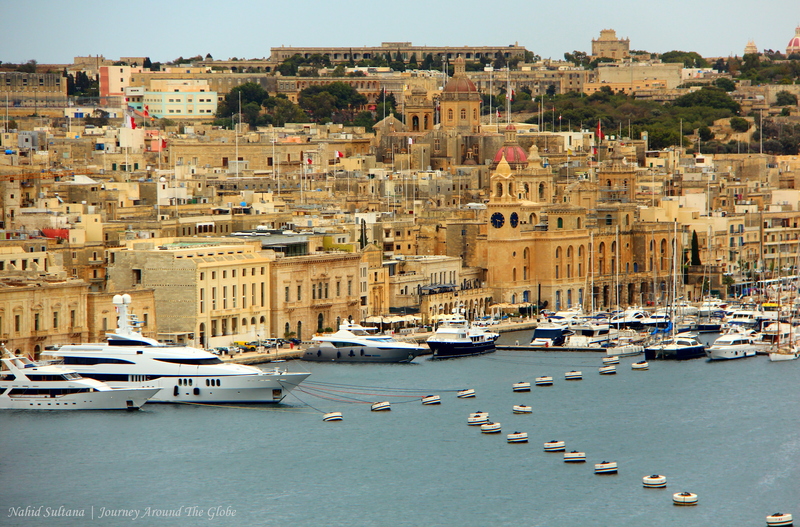 You can get a jaw-dropping view of Valletta standing in Sliema harbor. EATING and SHOPPING: Maltese love their rabbits and it’s their national dish. First lunch in Malta, we sat down in a nice restaurant, San Giovanni, in St. John’s Square right in front of the cathedral. And I had to try a Maltese rabbit, of course. There were many dishes here that serve rabbit in different forms. 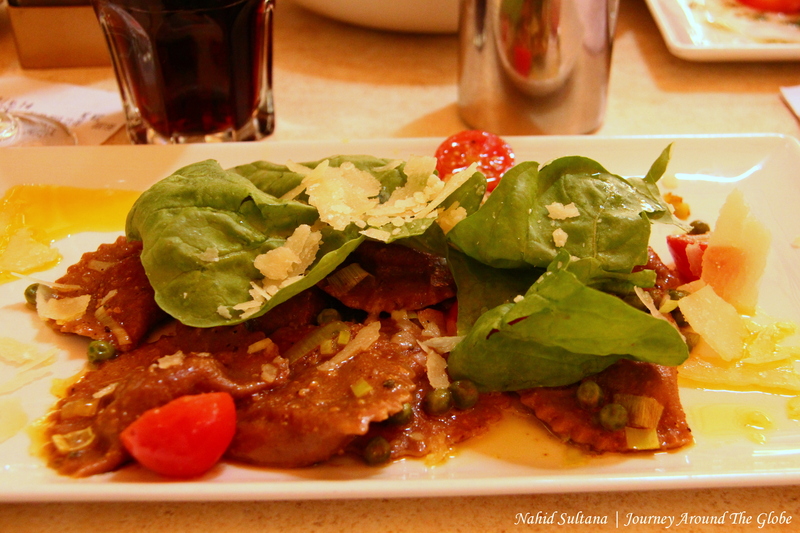 I tried rabbit ravioli with herb sauce and olive oil (or something similar)…it was beyond my expectations, so good. Most of the cafes with tables and big umbrellas in the sunny piazzas are full of people throughout the whole day…drinking, chatting, eating, or just enjoying, loved it. 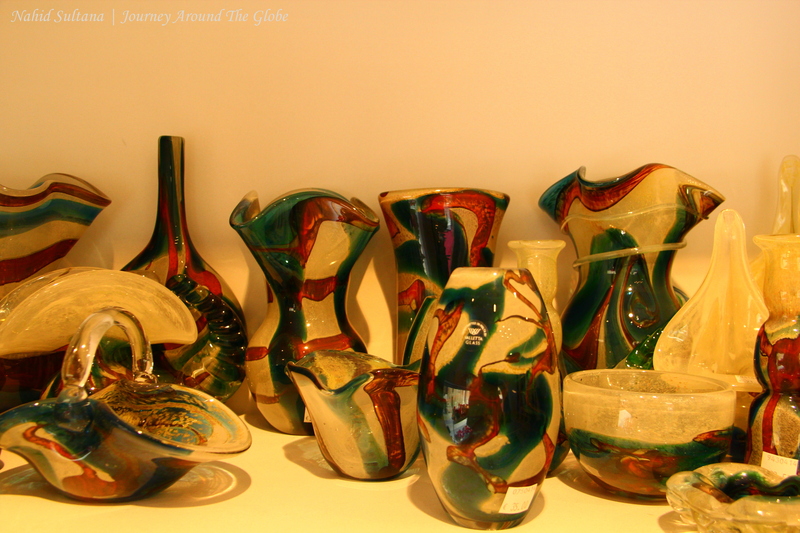 Hand-made glass arts from Mdina (a small town of Malta which once used to be the island’s capital) are very famous here and something exquisite to take back home. We didn’t go to Mdina but there were few shops in Valletta where we bought our set of hand-blown glasses…6 pieces for 76 euros, couldn’t beat that. Other than that many souvenir shops in old town Valletta sell usual gifts items like t-shirts, bags, key-rings, and etc. 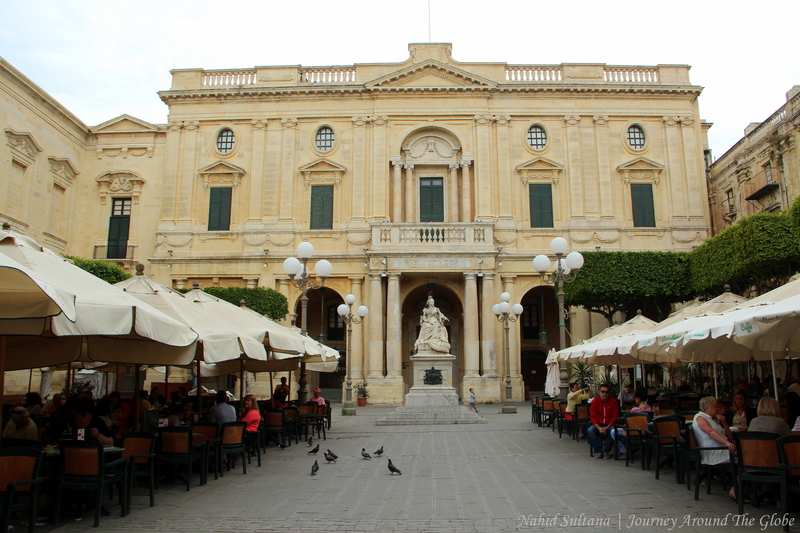 PLACES WE’VE VISITED: We spent about a day and half in Valletta. 1st day in Valletta we couldn’t see the main spot of this island, St. John’s Cathedral, since it closes at noon on Saturdays. So we had to come back on Monday for that. Just to keep something in mind that every cathedral or church in Valletta is either closed completely or for half a day in weekends. There are few museums in Valletta for archeology, fine arts, and wars, if you are into those. And if time allowed us, I would have visited some gardens, and Palace of the Grand Masters, now Presidential Palace. Mdina is another city of Malta which is worth visiting for a day too, but didn’t get a chance. 1) ST. JOHN’S CO-CATHEDRAL: The simple façade of St. John’s flanked by two large bell towers has more of characteristics of a fortress than a cathedral reflecting the sober mood after the historic episode of Great Siege of Malta. But no one can imagine its lavish interior by looking at its plain face. It was built in 1577 in the very heart of newly founded city of Valletta to serve as the headquarters for the Knights of St. John. The cathedral’s glorious Baroque interior reveals a spectacle of rich marbles, precious metals, paintings, and decorative ensembles that overwhelm the spectator with an impressive first vision. Elaborate motifs on the side walls and gilded foliage, flowers, and angels are some characteristic of Baroque ornamentation of this monument. 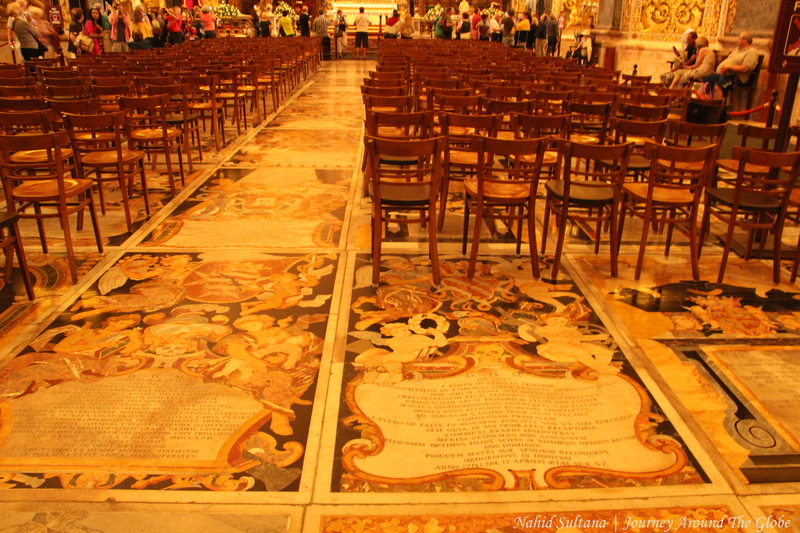 The splendid inlaid marble memorial slabs on the floor are a collection of tombstones of important knights and noblemen make this floor a unique treasure of St. John’s. Some of these tombstones reveal individual stories, their acts of chivalry, and religious ardor. A huge, vigorous work of art dominates the oratory. Overall, every inch of St. John’s Cathedral is an incredibly ornate place and by far one of the grandest cathedrals I’ve ever seen so far. 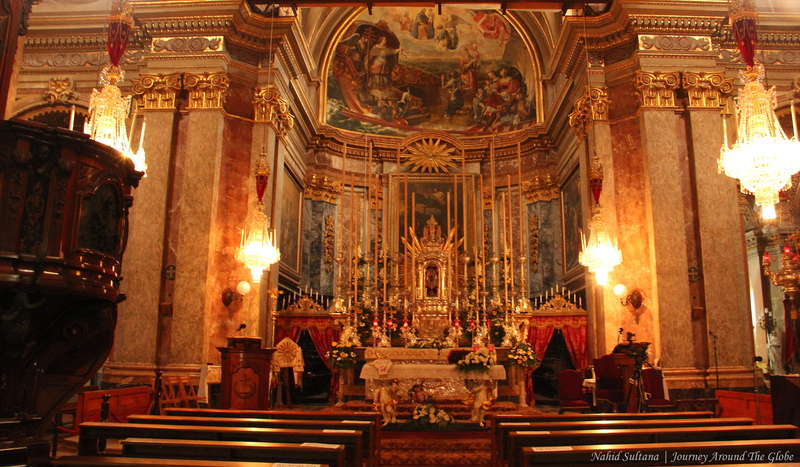 FYI, There are 365 churches in Malta…one for every day of the year to worship!! We couldn’t go to the museum or the crypt where many tombs of Knights of St. John are kept. Visitors should dress properly covering their shoulders, chest, and legs upon entering the cathedral. Opening hours for the cathedral is Mon-Fri from 9:30 to 4:30 pm (last admission at 4 pm) and Saturday from 9:30 to 12:30 pm (last admission at 12 pm). It’s closed on Sundays and public holidays. Entrance fee is 6 euros for adults and children under 12 years are free. The fee includes visit to oratory and museum in addition to an audio tour guide. 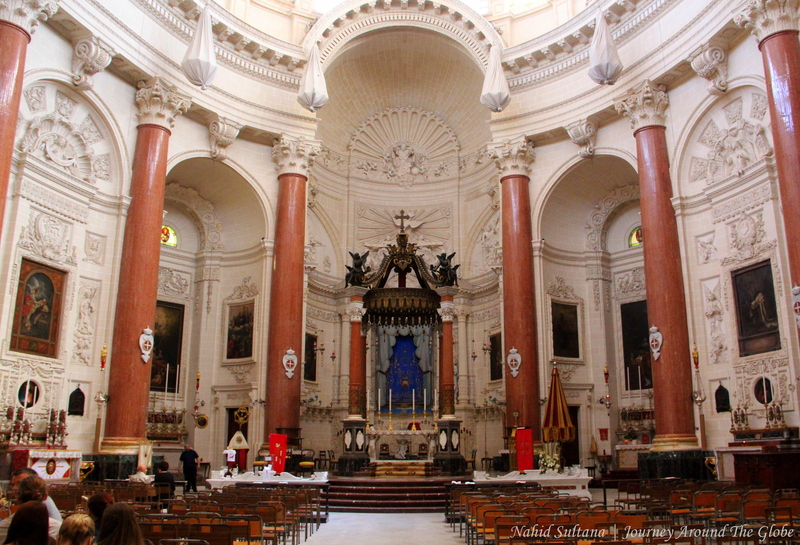 2) ST. PAUL’S PRO-CATHEDRAL: This is an Anglican church (Church of England) of Malta and Gozo. It was built in 1844 in neo-classic style with simple and spacious feel. Maltese limestone was used to build this cathedral. Its 60 meters spire can be seen from Sliema across the sea. The cathedral is a noted Valletta landmark. It was free to enter but if you take pictures you are supposed to pay 1 euro. 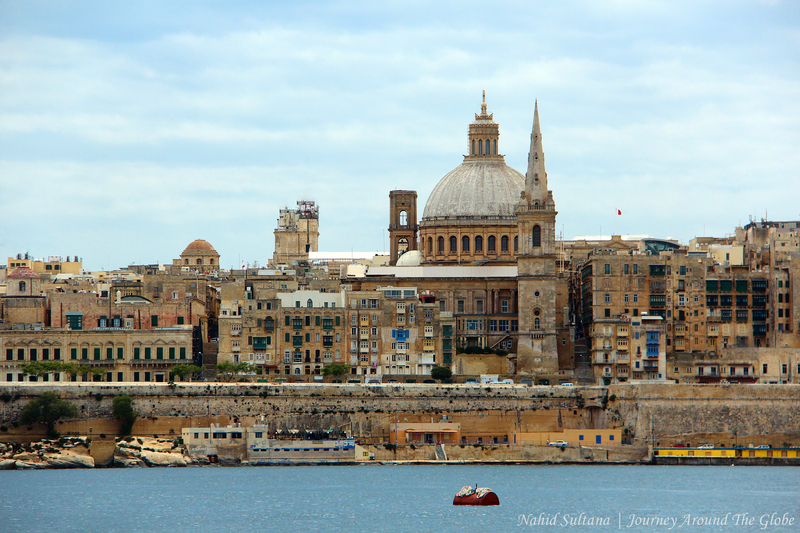 3) TEL-MADONNA TEL-KARMNU: The dome of this Catholic Church dominates the view of Valletta as seen from Sliema. It has a gorgeous and spacious interior with high copula. It’s located right next to St. Paul’s Cathedral and there is no fee to enter. 4) ST. DOMINIC: We walked inside this church while walking back to our ferry terminal. Exterior of this church had old façade. 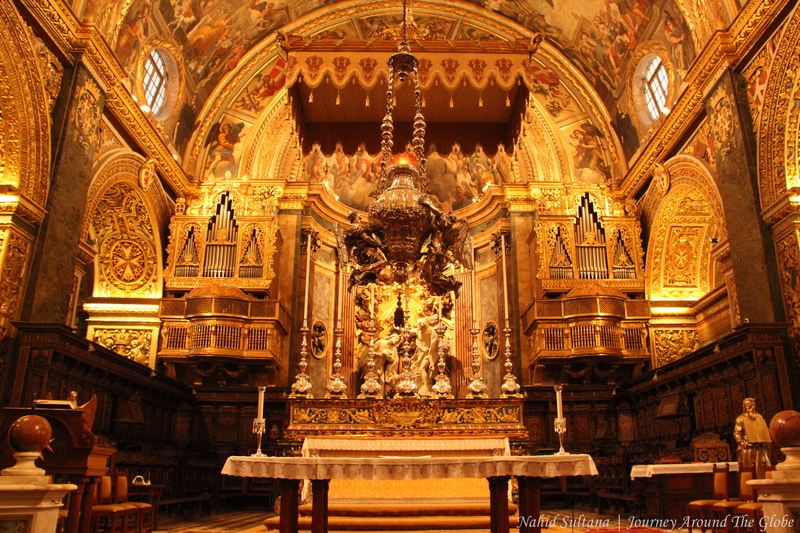 But inside was very decorative with beautiful ceiling and a gorgeous altar. 5) UPPER BARACCA GARDENS: This garden is located on the upper part of the town offering visitors unrivalled views across one of the world’s largest and deepest natural harbors, Grand Harbor, and over to the Three Cities. The garden itself is small but pretty nice place for strolling. There are some fountains, statues, and arches that make this place really charming. There was a wedding going on when we went there. The old Saluting Battery provides artillery salutes to visiting dignitaries and shipping. A noon-day gun is still fired daily, recreating the age-old tradition. It’s free to enter. 6) NATIONAL LIBRARY of MALTA: The origin of this building dates back to 1555. We didn’t go in, but as I’ve heard, a huge archive of the Knights of St. John from the Crusades in the 11th century until the late 18th century are kept in this library. It’s located in Republic Square next to Grandmaster’s Palace. 7) FORT ST. ELMO: This is an old fort at the tip of the peninsula. 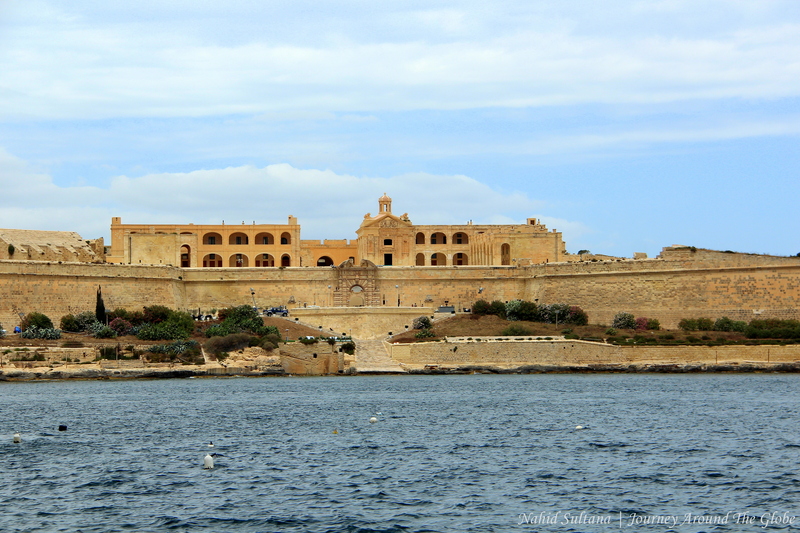 It was also built by the knights in 1551 guarding the entrance to both Grand and Marsamxett Harbors. Turks tried to invade it in 1565 but overall, this fort was never invaded by anybody in the history. We couldn’t go there since it was under renovation that time. 8) GREAT SIEGE SQUARE: This is a nice big square which has the entrance to go to St. John’s Cathedral. Opposite of the cathedral is the Justice Department of Malta. The square has lots going on with many shops and clothing stores in one side. That’s where our daughters got henna tattoos on their hands. There were many street vendors with trinkets all over the square. Great article and photos. Thank you for writing that. Wow, thank you very much for the pictures and the information. I will work as an intern in Malta for six months as from October and I think I will visit all of these places :-).